These brownies really have been a long time coming. 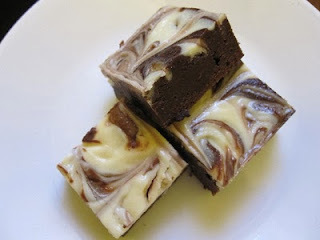 I think I've been bookmarking cream cheese brownies since I started baking (admittedly that's still only a few years). I guess I could blame my cream cheese hating brother on why it took so long to make these, but that's not entirely true. Sometimes when I look at a recipe I just think, wow.. that is a tonne of "not good for you" wrapped in such a tiny little delicious package. But seeing as I had a block of cream cheese sitting in the fridge, I decided it was time. I went looking for a recipe that proportionately looked good to me. Specifically, I was looking for one that would use up as much cream cheese as possible. The recipe I settled on would, in theory, use up nearly all of my cream cheese. Why in theory? Well I know that David Lebovitz is pretty respected (I don't follow him myself), but he has a problem with some of the values that show up on his site. Granted, maybe I'm just picky. I can accept that his measurement for flour is 140g a cup, which is one of a thousand accepted amounts. I'm baffled by his measurement for sugar since if 2/3 cup of sugar is 130g then 5 tablespoons of sugar is 63g not the 75g listed. But I can let this go. I can only assume that he is not measuring by weight, but instead measuring and then weighing. However, what I can't figure out is where 8 ounces of cream cheese is equivalent to 200g. 8 ounces by weight is roughly 227g. 8 ounces by volume would be roughly 240g (given the 15g per tablespoon listed on the package). My package of cream cheese is 250g. So what's a boy to do? Sure, I could have just taken his 200g amount, but I chose to go with the 240g instead, because a) I wanted to use up the cream cheese and b) I like cream cheese :). Besides, if I worried about every time I experimented with a recipe, I would be a nervous reck (wait... I am a nervous reck). On that note, and because obviously the given values could not be trusted, I decided to throw caution to the wind and make a few more changes. I varied up the chocolate using 70% Cocoa Lindt chocolate (still leftover from the pudding) paired with my favourite semi-sweet chocolate chips, which I also used for the added chocolate chips. Amusingly, for all these changes the only part I was really apprehensive about was probably the easiest and most fun part of the recipe: the swirling of the batters. It's something I have never done. I had read a few tips on how to do it (sad, I know) and I didn't want to mess it up. Like all things, I wanted nice distribution for each bite. I tried to swirl without worrying too much and when I was done couldn't resist making a little design. The smell of the house while the brownies baked was drool inducing. Then waiting for them to cool was nearly unbearable. I fought the urge to cut into them warm. If there is one thing I have learned it's that a warm brownie is rarely the best brownie (unless paired with ice cream). It was worth the wait. Once I was able to slice and taste, I was in love with the chocolate cheesecake flavour. How could you not be? The cream cheese part was just a tad sweeter than the brownie, which bordered on a bittersweet chocolate flavour. It balances very nicely. The texture variance within one bite was also quite nice, especially with the chocolate chips, which I'm glad I didn't remove (for once). 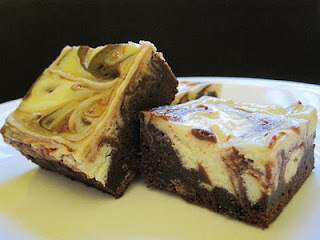 It was a great textural surprise after biting the soft and creamy cream cheese layer with the chewier brownie layer. Not to mention the chips gave a nice little mid bite chocolate boost. And the flavours were much more intertwined than I had anticipated. It was almost difficult to tell where the cream cheese ended and the brownie began. It truly did taste like chocolate cheesecake. And in a Shyamalan-ian like twist, (only good -- hmm..feels like I've used that joke before), these brownies were much lighter than you would expect. Not too rich, but delicious throughout. In a small bowl whisk together flour, cocoa powder and salt. Place a medium heat proof bowl over a pot of simmering water. Add both chocolates and butter and heat until completely melted. Remove from heat and beat in sugar. Add eggs one at a time until completely incorporated. The batter will become shiny. Add vanilla and mix until incorporated. Add dry ingredients to batter and mix until combined. Pour brownie batter into prepared pan and spread evenly. In a medium bowl add cream cheese, sugar, egg yolk, and vanilla and beat until completely combined. 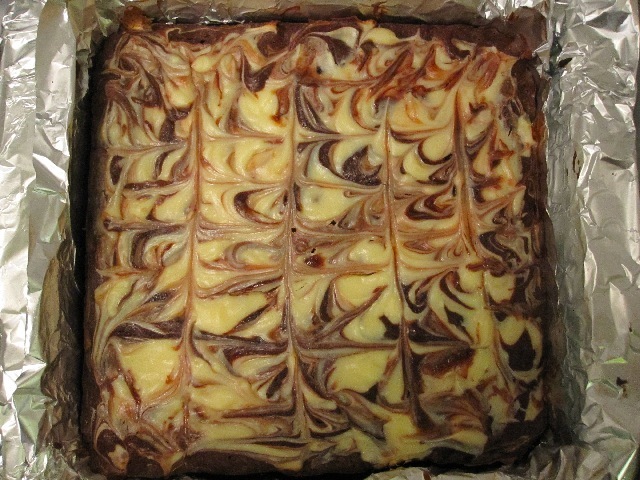 Drop eight roughly even spoonfuls of the cream cheese mixture evenly across the brownie layer. With the tip of a knife swirl layers together, but being careful not to swirl too much. Allow to cool completely in pan before slicing and serving. Hey Adam! You don't know me but I'm a fellow food blogger who found your blog through Anna's writing. I have the same relationship with cream cheese brownies--I long to make them but they seem quite decadent, and my other concern is about spoilage--do you know if these would have to be refrigerated if I say, bought them to an office where I knew they would likely be left out all day? Hi! Welcome to the Twilight Zone's Bakery :). I think they would be fine sitting on a desk for a few hours (I mean honestly how long could people resist?). It wouldn't be any worse than leaving cream cheese out for a day in order to soften it for a recipe. But for overnight storage you definitely want to use the fridge.